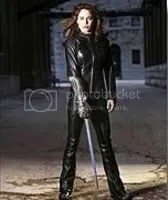 You may recall, many posts ago, (if you have been following along) I mentioned how many vampire slaying stories have a Dhampir, or half vampire (in contemporary media also called a “Daywalker”) as the lead protagonist, using their vampirically enhanced abilities in conjunction with their ability to resist factors that would traditionally kill normal vampires (such as daylight) as weapons against their full vampire foes. Just look at those curves. A long, double edged blade sporting a set of complex curves that just don’t stop, but somehow manage to end in a wicked looking point. And yes, I am referring to the blade, though Rayne isn’t exactly lacking in that department either, if you just so happen to be into haemophages and such. But most definitely my kind of blade. It’s a thing of beauty. I’ve loved the contours of this blade from the first second I saw them in the game. 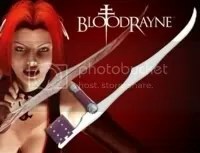 Above is a pic of the dead sexeh duo themselves, Rayne and her blades. Totally killer. Literally. 🙂 As you can see, she’s got quite the set up going with those blades. 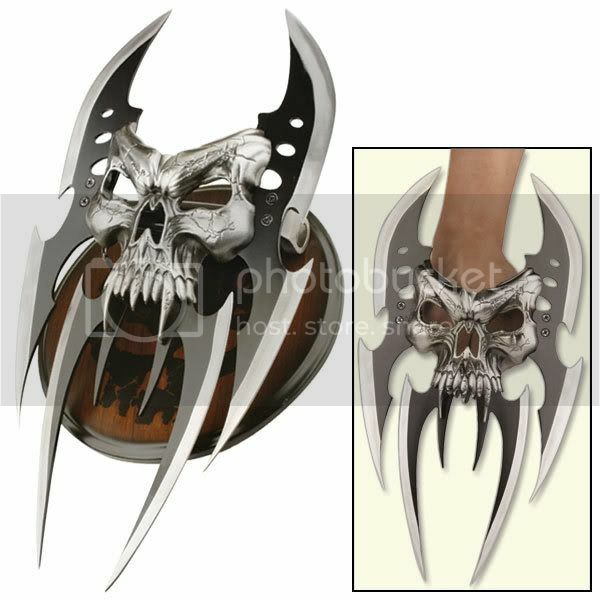 A dual band bracer gauntlet setup, with the blades attached to a special swiveling hinge that allows for two degrees of vampire slashing freedom of rotation. In the game, she’s also able to lock the blades out of the way up by her elbows when she isn’t using them. No scabbard required. But like I said, all is not perfect. 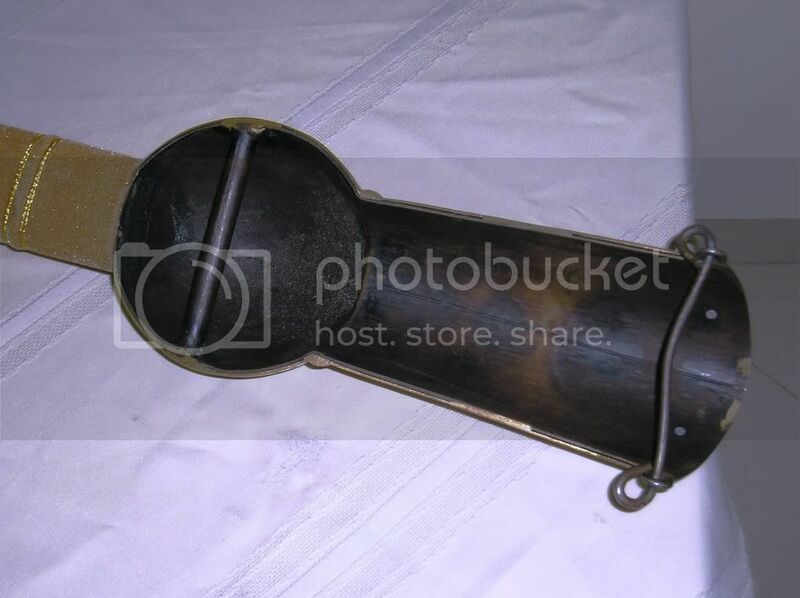 As you can see from the pic, there really doesn’t seem to be a locking mechanism built into these things. So the whole locking thing is suspect to me. 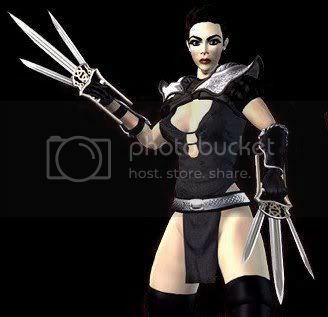 Not to mention that based on these pics, she would be locking it with the larger blade facing inwards. In my book, having a few razor edged feet of steel next to my skin would not be the preferred way to stow a blade. In fact it would make me downright nervous. Yet Another Uber Battledome Blade! Now this weapon is a bitter sweet comeback to me, because although it appears to me to be an improvement on the original Critical Mass design in many areas, it also takes a step backwards in a few others others. 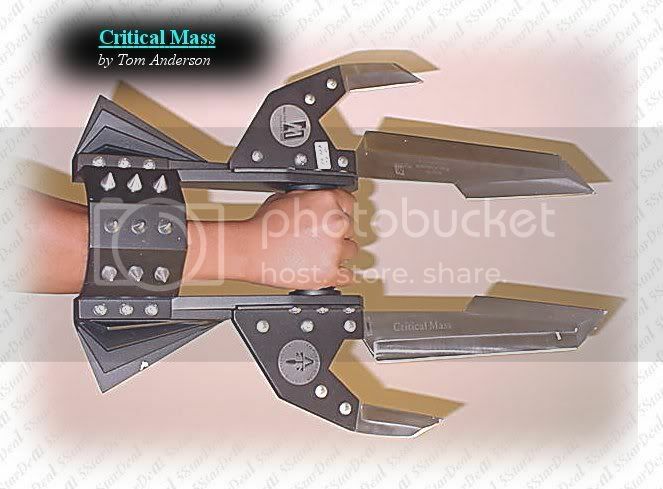 For instance, on the original Critical Mass, the handle was placed fairly far forward, and had a “hood” that extended far enough back that it rested on the users forearm. Though this design left your actual hand exposed, it allowed for a great deal of control of the weapon. On this weapon, although the hand is pretty much covered, it pretty much stops there. You have much less leverage, and therefore less control. And then there is the mounting point for that front blade on Critical Mass II. I’ve never understood why you would make a fairly wide blade, and then weaken it at the attachment point by narrowing it just before the hilt. Again the first version did not suffer any such weaknesses. 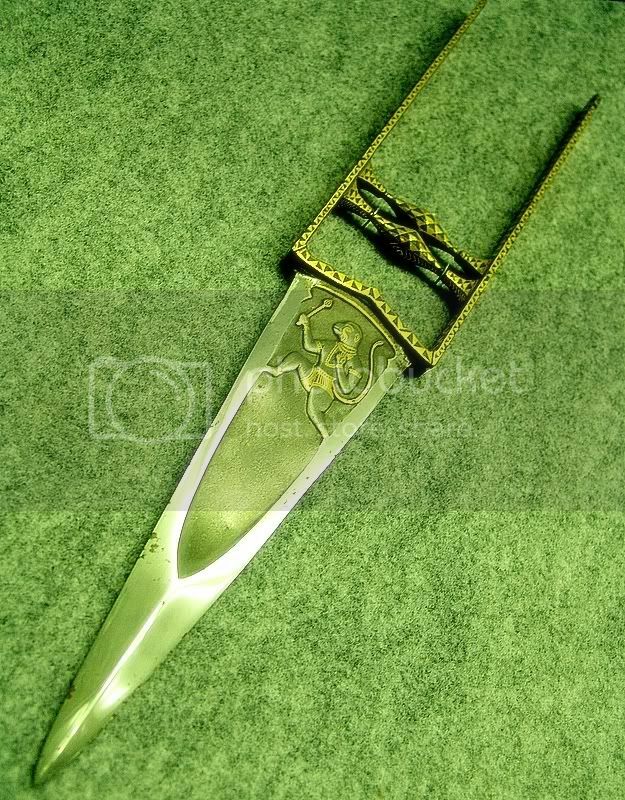 Of course I would be remiss not to mention that the basic weapon design does appear to have at least superficial similarities to a perhaps much more practical weapon, called the Katar. 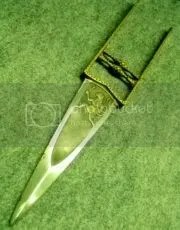 The Katar is a punch-blade style weapon of Indian decent. 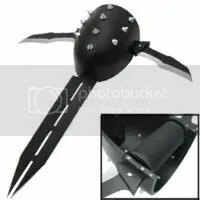 Some of them have mechanically actuated split blades, also called “Scissor Katars”, and yet another variety called the “Hooded Katar” have a shield over the back of the hand. Given also that it would probably be a lighter and faster weapon, I would probably prefer to use a split-blade hooded Katar if given a choice, over either Critical Mass weapon. Nonetheless Critical Mass II does have a lot of strong points. Literally. It is simpler and the blades are much more effectively placed than in the first. It is probably also lighter and faster than the first. It provides much better hand protection, though it could have benefit from an extended hood for both forearm protection and extra support and control. 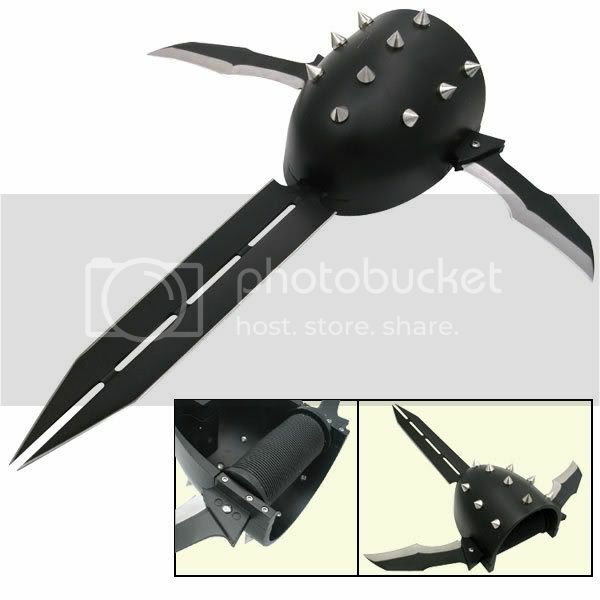 But given the sweet lines of those, oh-so-beautiful black blades, the menacing spikes on the guard, and the overall no nonsense look of the piece, I’d say it’s a winner. I dare you to disagree. I dare ya. I double dog dare ya. I triple dog dare ya… Yeah… Whatever. 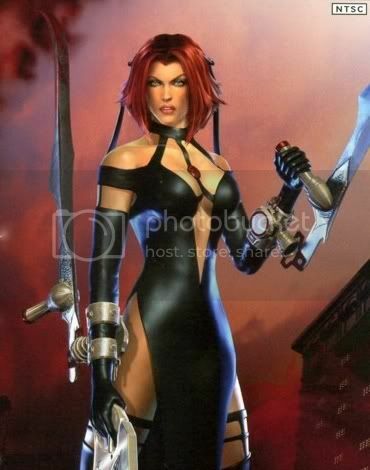 Now having actually read a few of the comics that the Sara Pezzini character (played by Yancey Butler) was based on, I have to say that the live action TV series sucked all of the freakin’ “witch” out of the “WitchBlade“. The comic book Witchblade was awesome purely because of the sheer versatility and resulting coolness of the Witchblades armor. In the comic, when activated, the WitchBlade protected it’s wearer with a kind of H. R. Gigeresque organic armor, which could make scorpion fish-like spines, blades and whatnot emanate from the arms, hands back, legs, shoulders, etc. Much like the comic book Spawn armor, except the Spawn movie got the armor right (with the help of a lot of CGI effects). The Witchblade armor could be mentally willed to form bladed appendages and weapons of various forms, as well as fire energy blasts, darts, etc. Just episode after sweet episode of sheer, unadulterated wearable wickedness. So, given a chance to make a live action version of this marvel of comic book weaponry, what do they do? Bollox it up. As you can see from the pic above, in their infinite wisdom, they turned the glorious Witchblade into little more than a medieval suit of armour, with what can only be described as a rather simple gauntlet sword as it’s primary weapon. Pointless. Silly. Bah! What a waste. Yeah, yeah, the blade gauntlet could retract into a small unobtrusive bracelet. Big Whup. For all it’s usefulness as a sword, they might just as well have given her a rapier and said “have at it!” against the baddies. Compared to the immense flexibility, power and, more importantly, the unique aesthetic presence of the comic book Witchblade armor, this was a point of great disappointment for me. 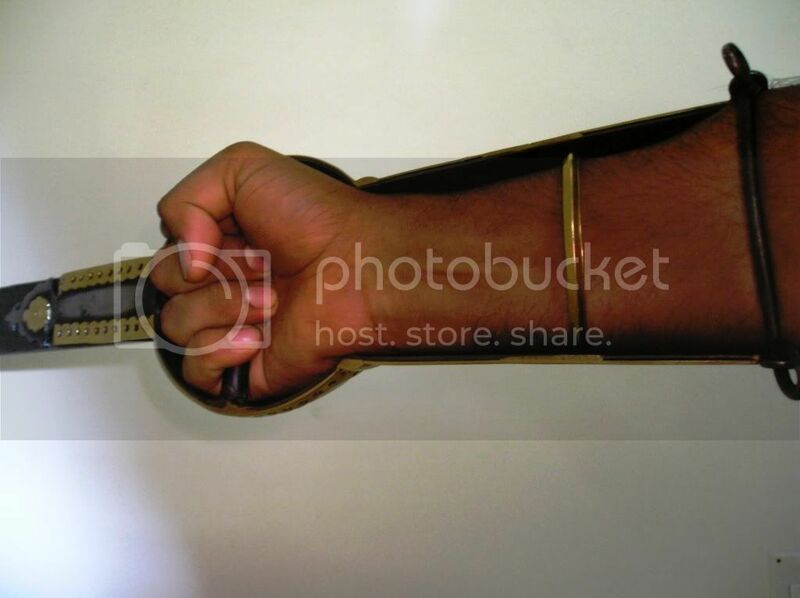 The Pata is a sword gauntlet from northern India which, As you can see, bears an uncanny resemblance to the live action WitchBlade sword. However, unlike the WitchBlade weapon, the Pata is not a full hand gauntlet. It simply covers the top of the hand and forearm. 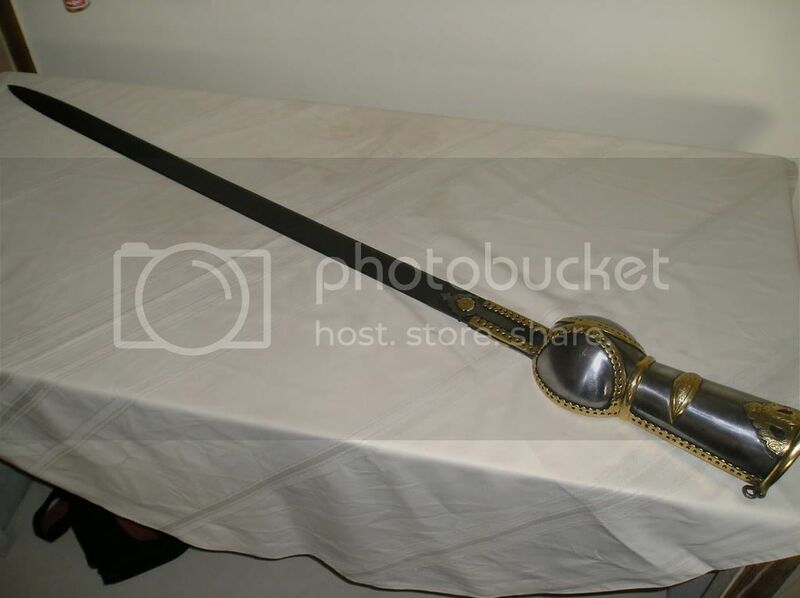 As you can see, the handle is set in the middle of the semi-spherical hand guard, and a brace at the top of the forearm guard helps gives the wielder better control of the weapon. 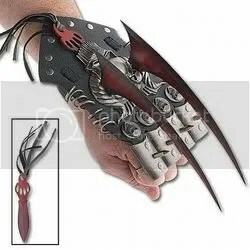 Perhaps not as convenient as a blade gauntlet that retracts into a small bracelet, (a-la-the movie WitchBlade), but it would probably a safe assumption that it’s fairly lethal in it’s own right. And did I mention that this particular Pata had a blade of damascus steel? A dark, stylish and sinister blade. What more could one ask for? Well, actually a proper, well made, CGI enhanced live-action Witchblade movie, for one thing. But I’d settle for a Pata. Heh. I’m easy like that.